No, that area really isn't a possibility for a GCI. Not enough space and too hard to work around Steel Force's helix. but seriously, none of that sounds even safe. I cant believe their keeping the POS. It'll stay open until it decides to spray hydraulic fluid all over guests again! Unless there have been changes in recent years, that is impossible due to noise. The houses across the lake and along Haines Mill Road would never allow a wood coaster there. That is one of the main reasons Hydra did not go down the hill like Hercules did. And cant they do what cga did with gold striker? where they used tunnels and Styrofoam? They could try the measures CGA took to cut down noise, but I think the better option would be to build a wood coaster in the woods (replacing Dinosaurs Alive), and use the lakefront area for something else. I would love to see Demon Drop removed and that whole area rennovated as a classic area, with the centerpiece being a haunted dark ride themed to the Mansion House or Castle Garden. Im split on Demon Drop. Its cool to have one of the last ones remaining at our park. Though I dont ride it, because the one time I did it was painful. Im not so sure DD would be in the plans to leave though for awhile. But who knows. As per the Dorney Park website, "The Cedar Creek Flyers will be added to the lower section of the park across from Stinger. This unique experience is an updated version of a classic thrill ride. Riders will sit in one of eight “eagles” suspended from arms 28 feet in the air. 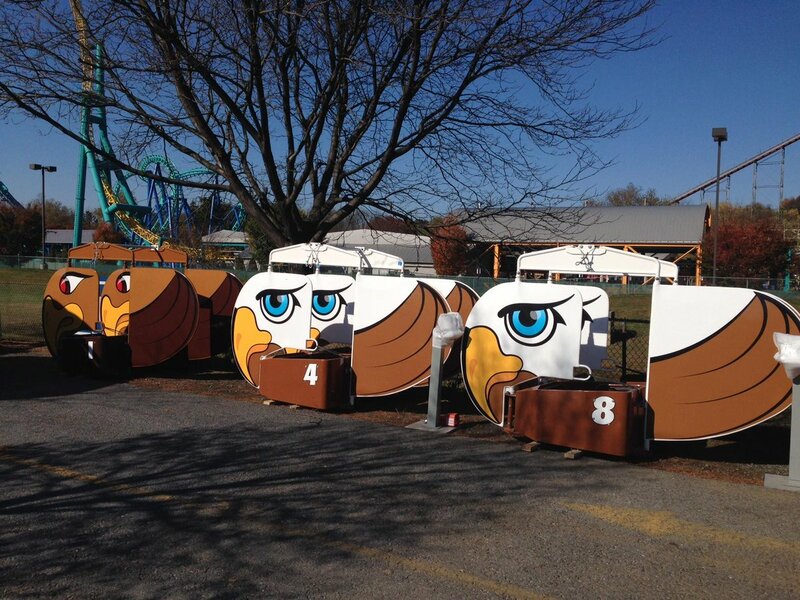 As the ride spins, the eagles will swing outward – and riders have the unique opportunity to control their flight experience from mild to wild!" its going where the rumored windseeker wouldve gone? Yes, it will be located in the already poured cement circle. Here's my story on the news, with a few additional details. I'm so glad the park got to expand again in '15! Glad to see the food options continue to improve. Barbeque is a perfect addition. The Flyers will be nice in that spot too. But atleast Dorney is getting something new. Itll be a good family ride. Wonder why approval for it took so long? It is my opinion that timing of the announcement for the Cedar Creek Flyers is intentional, due to the fact that Kings Island just made a Flying Scooters announcement today. I am going to assume the talk about needing regulatory approvals is for some as of yet unannounced addition, modification, or replacement. The park probably wants to avoid another incident like the fireworks. Did you guys see this on Twitter today? With the cars already having arrived I would think this was planned quite some time ago. I agree with you. They probably have been planned for awhile. Though I most likely wont be riding them, they do look nice. Hopefully they are upkept and continue to look nice, and that the ride is run good and not neutered. I was hoping for the whole midway makeover like the other parks got with a disko and everything, especially with approval taking so long to get, its kinda a bummer. But atleast their adding something. I love me a good Disko! I would love to see a classic zipper. And a small coaster like Trailblazer. This is not 2015 related by i found these two links interesting. If only they had these online for all the other mazes!!!!! !